However the variety of contents can affect negatively the cache hit ratio. For example, when there are 3 video quality levels and each user requests different video quality, the benefit of the in-network cache is null (see Fig.1). To cope this problem, the bitrate selection technique for fairness was proposed. But we will show other approach for tiny PC. A video is a sequence of continuous images called as “frames”. The adaptive frame rate control method is to change the number of frames to be displayed per second (see Fig.2). In particular, each frame has a unique “name” on ICN. Consumers decide the requesting frame according to their own network quality. 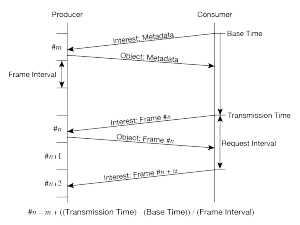 Even if each consumer’s frame rate is different, they utilize in-network cache because they require the same “frame”. This advantages reduces Producer’s processing and transferring load, thus we can deliver the 360-degree panoramic video by the tiny PC (Raspberry Pi). This estimation scheme is simple but operates normally. In-network cache is a feature of ICN, but how to utilize it is one of the challenges. Since the current approach on IP-based architecture is not always optimal, when we design an application, it is important to think how to benefit from ICN’s features, and this work is a concrete example of how to do it.